This rather belated tribute to the Sites on the Net has at last been set up. Whilst there are many well-established sites, like Philip Hind's, others are coming along fast. As you'll appreciate, I have had to concentrate on those which give basic information and provide some decent references (good or bad) to Lieutenant William McMasterMurdoch, the First Officer of the 'Titanic'. However, I'll include others where they are (a) unusual and relevant, or (b) want to link to my site, to give more depth to their own studies of the officers on board. Contact me, if you know something suitable. Mr. Philip Hind's remarkable 'Encyclopedia Titanica' is without doubt the most informative all-round interest site on the Internet. It is also a 'heavy hitter', - over 600,000 on the current counter. I was rather moved when I discovered that Mr. Hind had added a reference link to this site to the Contacts E-mail page of his site. I thank him for this kindness, and will provide a link to his site in return. A very American offering with its own following. To its credit are some excellent graphical indices, and much information. Visitors can join online and order the Society magazine 'Commutator'. There is a description of their Museum, a tour of the ship (though I prefer Hind's), a remarkably fine souvenir and book catalogue, an events guide and a Frequently Asked Questions section. Don Lynch and Ken Marschall are leading members of the THS. What do I mean by 'very American' ? (1) : It's mostly a pun on the American Titanic Historical Society. (2) : The American delight in events is manifest, as is the American love of souvenirs and merchandising. I hope that this will explain the 'very American'. I am, after all, 'very British'. Another excellent site, with an easily-understood listing of events during the life of the 'Titanic'. Simple, but rich in information. The structure and information in this site has given me a great deal of help. A rather opulent site that has some very interesting data in tabulated form. The site layout and page design is definitely worth studying. As in many sites, there is an undue emphasis on class distinction rather than on ship's layout, when considering the death-toll. One interesting point is that Fifth Officer Lowe is said to have apologised for using the adjective 'Italian' to imply cowardice. Only reference to this found so far. Included because it has a lot of interest in the officers and crew. Very much a fans' site. Some good pictures and enjoyable links. 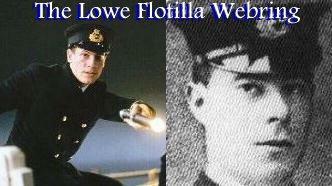 This site is owned by Lowe Flotilla WebRing member Richard Edkins. Want to join the Lowe Flotilla? These people are just building a site, and have done me the dignity of asking permission to establish a link between us. I'm watching them with interest. A site on the Cameron film's actor Ewan Stewart, who took the part of Murdoch. Well played, and worthy of a better script. I have heard one account that Ewan Stewart appealed to the Director to moderate the portrayal of William Murdoch. Otherwise, the portrayal would have had him taking more money than any bus-conductor, before or since. Well done, Ewan Stewart, and may your career continue. Holds the usual careful and precise 'Encyclopedia Britannica' entry, in this case for the 'Titanic'. Recommended by Claire Thom. The main South African website on the 'Titanic', with an excellent boat loading list. The Murdoch of the 'Titanic' website is being written to set the record straight. Information and editorial assistance is being given by Mr. Samuel Scott Murdoch, the nephew of the First Officer of the RMS 'Titanic', and the maritime historian, Mr. Ernest Robinson. To make a Donation to the official Murdoch Memorial Prize fund. last updated 10th March 1999.